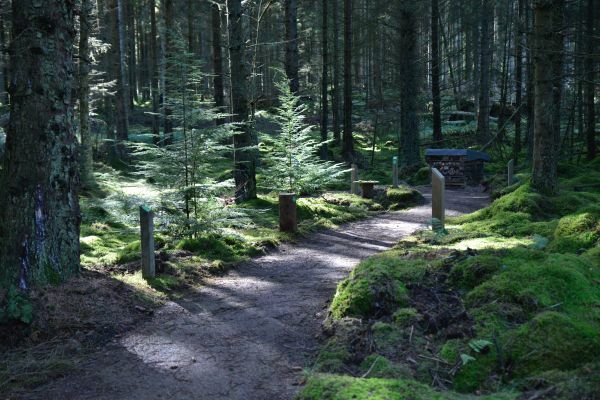 A beautiful new easy walking route, “The Wild Walk”, has been created at Bakethin Nature Reserve at Kielder Water & Forest Park for all ages to enjoy. This is the first of three new walking trails at Kielder now featuring on the popular walkers ViewRanger app. Simply install the free app and search for Kielder Water & Forest Park Wild Walk. You can then easily download the route and information on a smartphone beforehand, so you have it to hand whilst walking. The app not only gives directions and suggests what to look out for, but also offers fascinating wildlife information at each waypoint. Visitors can also listen to audio clips of Kielder wildlife experts talking about all the varied species who live here and how they are cared for. All these developments, along with new features, signage, and accompanying digital and on-site information were commissioned by Kielder Water & Forest Park Development Trust through the Heritage Lottery-funded “Living Wild at Kielder” project. This easy-access, new Wild Walk is around 2.2km long (there and back) on even-surfaced paths. It is also accessible to wheelchair users and buggies. It is clearly signposted from Bakethin Nature Reserve car park and leads under Kielder Viaduct, past the dipping pond and along the Lakeside Way to Bakethin Hide. There are beautiful views, interesting wildlife, curious habitats and new interpretive features. Kielder Viaduct is home to bats and birds and a favourite spot for wildlife to take a drink at the water’s edge. The dipping pond is a peaceful place to get close up to watery wildlife and the walk then winds its way through conifers, mossy woods and secret spaces. Close to Bakethin Hide walkers can enjoy an exciting area known as the “Wild it Up Clearing”. This is a unique outdoor space for all ages to explore wildlife including: a periscope to see a “bugs eye view”; a mirrored disk to “look up by looking down”; an artist’s pallet to match items you can find with the colours; and a bug hotel! The Clearing is clearly signposted and highly engaging for curious little people. Just before the Wild it up Clearing, for weary walkers, there’s a beautiful Wildlife bench carved especially for the “Living Wild at Kielder” project by award-winning, self-taught Consett wood carver Tommy Craggs. Four very real-looking otters provide the arms and shoulder rests, while salmon swim along beneath, and an osprey with outstretched wings, alights from the rear. The bench has already become very popular with visitors. Further along the Wild Walk is Bakethin Hide - designed, built and completed last year in partnership with University of Newcastle MArch (Master of Architecture) students. It comprises two, spacious, hexagonal pods, the 'lake view pod' which faces the water, and the 'forest pod' which looks to the water and also back into the forest. All manner of flora, fauna and feathered creatures can be spied from the clear viewing areas of the hide. The large glass horizontal sash windows can also be safely and easily raised in order for people to feel they’re actually amongst it all. The hide is also accessible for wheelchair users and visitors find it a very peaceful place to be. The ‘lake view’ pod is slightly elevated towards an osprey perch on a nearby island which offers great views of the birds throughout the nesting season, as well as many varieties of ducks, geese and other birds. Sightings by visitors have included: osprey, mandarin duck, little grebe, teal, wren, cormorant, nuthatch, great spotted woodpecker, goosander and tufted duck. The ‘forest pod” has tall windows which give dramatic views of the close-up forest floor to its high canopy. Wood piles on the ground harbour all sorts of small forest creatures from toads, frogs and adders to hedgehogs, while red squirrels can sometimes be seen darting higher in the branches. Bakethin Nature Reserve is managed by Northumbrian Water working in partnership with Northumberland Wildlife Trust.